The laboratory vane shear test for the measurement of shear strength of cohesive soils, is useful for soils of low shear strength of less than about 0.5 kgf/cm2). This test gives the undrained strength of the soil, in undisturbed as well as remoulded conditions both. 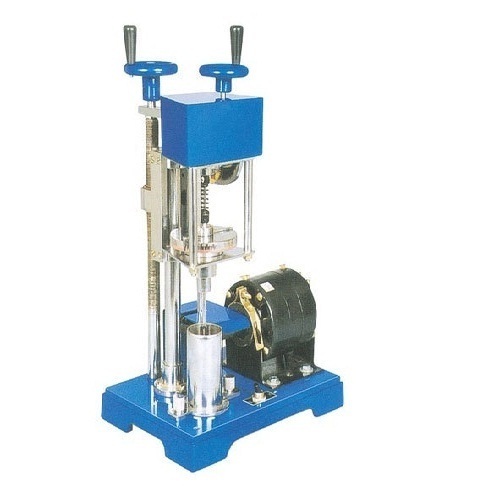 Vane shear test is a cheaper and quicker method of measuring the shear strength of clay, as compared to very elaborate tri-axial shear test or direct shear test. The vane shall consist of four blades each fixed at 90° to the adjacent blades. The width of vane, from edge of one vane to edge of another vane, is 12±0.15 mm. The height of vane is 24±0.25 mm. The thickness of vane is 0.5±0.05 mm. The vane should not deform under the maximum torque for which it is designed. The penetrating edge of the vane blades shall be sharpened having an included angle of 90°. The vane blades shall be welded together suitably to a central rod, the maximum diameter of which should preferably not exceed 2.5 mm in the portion of the rod which goes into the specimen during the test. The height of rod, above the vanes, is 60mm. The vane should be properly treated to prevent rusting and corrosion. 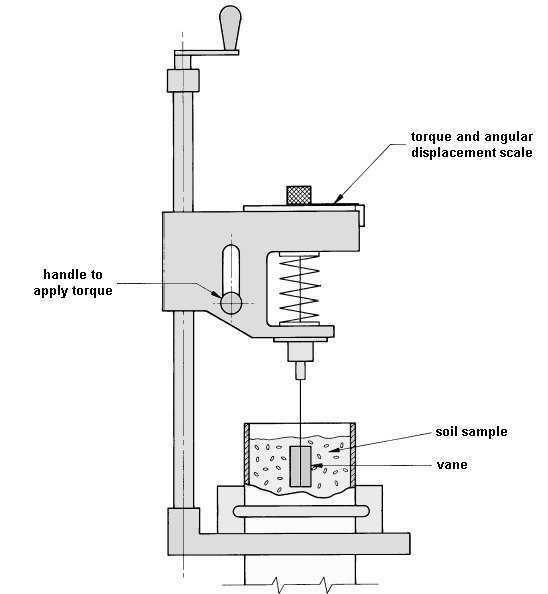 IS 2720(Part 30):1980 Methods of test for soils: Laboratory vane shear test (first revision). Reaffirmed- Dec 2016. Prepare two or three specimens of the soil sample of dimensions of at least 30.0 mm diameter and 75 mm long specimen. Mount the specimen container with the specimen on the base of the vane shear apparatus and fix it securely to the base. If the specimen container is closed at one end, it should be provided with a hole of about 1 mm diameter at the bottom. Gently lower the shear vanes into the specimen to their full length without disturbing the soil specimen. The top of the vanes should be atleast 10 mm below the top of the specimen. Note the readings of the angle of twist. Rotate the vanes at an uniform rate say 0.10/s by suitably operating the torque applicator handle until the specimen fails. Note the final reading of the torque indicator. Torque readings and the corresponding strain readings may also be noted at desired intervals of time as the test proceeds. Just after the determination of the maximum torque rotate the vane rapidly through a minimum of 10 revolutions. The remoulded strength should then be determined within 1 minute after completion of the revolution. For vane testing instruments that do not read the torque directly, a calibration curve to convert the readings to cm kgf of torque shall be provided. These calibration curves shall be checked periodically. Shearing Strength in the Horizontal and Vertical directions are the same. The shear surface is cylindrical and has a diameter equal to the diameter of the vane.